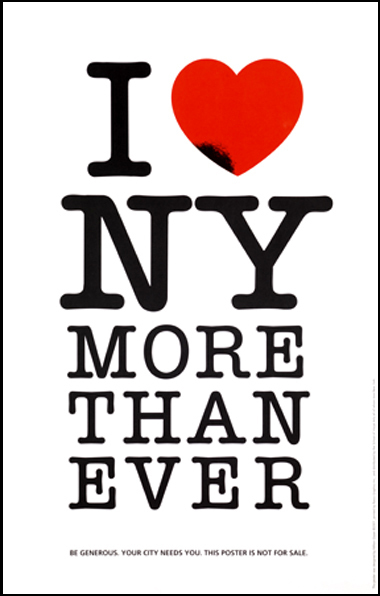 Legendary graphic designer Milton Glaser invented the famous "I Love New York" rebus and donated it to the city he loves. The city's Department of Commerce trademarked it and generated substantial income for the city. So the most difficult thing of course is how to introduce one’s ideas into the bloodstream of the culture. It’s very difficult without money or support or approval, because the nature of institutions is to resist all ideas from the outside... So I got a printer, and he said, “I’ll do it for nothing.” And so we printed 5,000 small posters. And so the kids divided the city into segments, and overnight, these posters appeared in windows all over town. And then I called Pete Hammill over at the Daily News, an old friend of mine. And I said, “Pete, I have something, and I wonder if you could find some use for it, or run it in the paper...." He said, “Great, send it down,” so I sent it down, and they called me back and said, “We’ll find a way to use it.” And a day later, they used it as a wraparound for that day’s edition of the paper—the whole thing—and there were a million copies of it out there. In the time-honored tradition of tasteless bureaucrats everywhere, the city employee reacted by threatening Glaser: “You know, you’re in violation of our trademark. So don’t try to use it in any way.” Soon Glaser received a nasty letter from a lawyer for the city demanding all of Glaser's records of how much money he'd made from the logo, threatening to subpoena him and take him to court. There are numerous obstacles to successful creative activity-- a paucity of talent or energy or funds, a paucity of opportunities or time or connections-- but perhaps the most aggravating and interesting obstacle is when morons dig in their heels to oppose it. Of all the hindrances on the artist's gauntlet, this one is the most unnecessary, yet nature has seen fit to place great energy and enthusiasm behind it. There are many colorful stories out there about warring with trolls. This has been one of them. It's pretty amazing that Glaser still loves NY after that. It seems to me that illustrators and graphic artists have to expend more effort "warring with trolls" than most of the rest of us. I suspect this may have much to do with the nature of the publishing industry and the number of individuals one has to answer to, although in this case politics had more to do with it. The fact that even Milton Glaser has to deal with such pettiness and ignorance should be reassuring to anyone dealing with the run-of-the-mill, close-minded editor. And, in Mr. Glaser's case, there wasn't even money involved. One good thing that's come up in recent years is the ease of self-publishing, or even just plain posting, on the internet. Illustrators now have recourse to put their commercially unsuccessful efforts "out there" in cyberspace. Still, as this episode shows, there's nothing like having friends in the real world to help with promotions. A great idea posted on a website is never going to have the same impact as one wrapped around the daily newspaper, at least not while there are newspapers. Wow, what a story. The comments above have said what I wanted to say. But just also wanted to include that I'm so glad you posted this eye-opener. "A confident giant is hard to love, but a vulnerable giant is easy to love." ~ I guess so. 'Pete' Hammill, I'm talkin' Peter Hammill. Damn bureaucrats hopped up with to much caffein. Ibsen~ Quick, call the cops, something' strange is goin' on at the Helmers. "However, they decided to improve Glaser's design by removing the black mark on the heart." Your knowledge of DEEP catalog prog rock combined with an uncanny ability for impromptu associations frightens and intimidates this little troll. In the words of the Blogger comment interface filter, Please prove you're not a robot. "A confident giant is hard to love, but a vulnerable giant is easy to love." I wouldn't call a country that has massive stockpiles of weapons of mass destruction and spends more on the military than the next 15 countries put together "vulnerable". And its constant warring upon other nations and killing of hundreds of thousands of people is not at all "easy to love" - especially if you're the one being bombed. Sorry to go off topic, but that line seemed a bit grotesque. MORAN-- I get the feeling that Glaser is big enough so that he appreciates even the city's exasperations. docnad-- I agree that self-publishing and even posting have changed the calculus in interesting, positive ways although ultimately I fear the sheer quantity of material turns it into a lottery process. अर्जुन and etc, etc-- I share etc, etc's amazement at अर्जुन's knowledge, not just of of deep catalog prog rock, but also of many other areas. I have previously argued that etc, etc's bisociative thinking is beyond the reach of any robotic software. But I doubt he will ever again equal the "eureka" moment of "Rah, Rah, Rasputin." Jesse Hamm-- That's a fun web site. 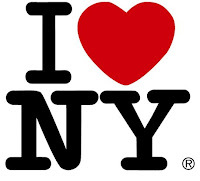 Anonymous-- I'm sure you don't mean NY isn't "vulnerable." Any place, regardless of its level of defense spending, is vulnerable in an era of asymmetric warfare where even one individual can inflict unacceptable losses on a population at large. NY may be distinctive in that it has gathered more things worth protecting than many other places. Yep, my mind is full of it. Dear Mr Apatoff. I'm a big fan of your blog. I really enjoyed this last entry on poor Mr Glaser's troubles with trolls, and I was wondering whether you would mind if I posted a translation I just made of this entry on my own blog, Safari Nocturno. It's a very small blog, but I'm sure its Spanish readers would be glad to learn about Mr Glaser's plight. Full credit will be given to you, of course. If still you don't feel comfortable about this, I'll give up the idea. This article doesn't add up to make the point it wants to. 1. The city aren't "trolls". They own the trademark to his logo that he sold to them. Whether they "wanted" the new version or not, it's derivative of their original and they have the right to it. 2. Is creativity really stifled here? He just recycled an old work. Make something original. 3. Apparently it's OK because Glaser didn't make any money. Oh wait he did but he gave it all to firemen and there's no evidence of this transaction anywhere. That's a little suspicious. David-- Thank you for writing, of course it would be fine with me if you re-posted this on your blog, Safari Nocturno. I am flattered that you think it is worth translating. Anonymous wrote: "This article doesn't add up to make the point it wants to." Perhaps I was less than clear about the point I wanted to make. I don't think owning a legal trademark prevents you from being a troll. Plenty of trademark owners lack artistic taste, sound judgment or even a touch of class. The law permits them to enforce their rights in petty or short sighted or counterproductive ways. I'm not accusing this municipal functionary of breaking the law, I'm accusing him of being a narrow minded dolt who impedes creativity and undermines the larger interests of the City. In a different category, if you have any suspicions about where the money went, I would suggest you look at the press coverage of the incident at the time (you can check the analysis in the NYT or read the quotes from the charities or the City). Personally, I think the fact that the City retreated and admitted error should tell you a lot. अर्जुन-- I hope you are planning to leave that brain to science. One thing I do believe, if you truly had the strength of your convictions you would not need to post as anonymous. Thank you David. Glaser has always been one to look up to in matters of taste and decorum. At first I thought that burn mark random and arbitrary. When I took another look a day later, I realized it was placed geographically as if the heart were Manhattan. It just reminds me how something or someone out of context is usually misunderstood. Makes me wonder if the "trolls" who took issue with Glaser's re-use had any understanding of his creative legacy or even the capacity to appreciate it? 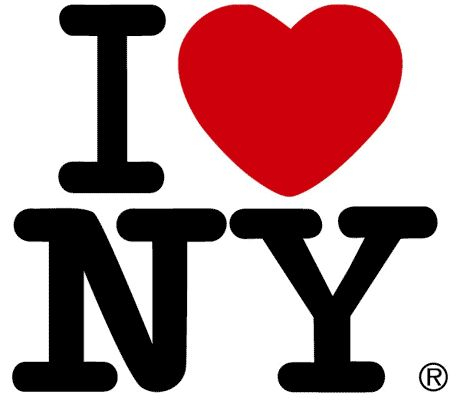 We just featured an article on Milton Glaser on our website www.livelymag.com! How ironic, he was truly inspiring for the art and graphic design industry. 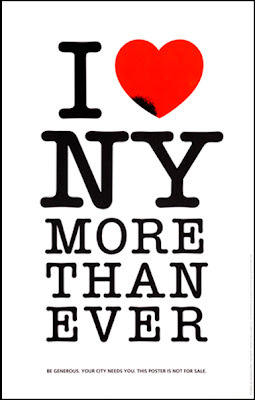 He continues to inspire, check out our feature on him here: http://www.livelymag.com/milton-glaser/.